Whisk together milk and Bearnaise mix in small saucepan over medium heat. Stir in butter until melted. Blend in orange juice, lemon juice and orange peel; stir and cook until thickened. Cover and keep warm. Heat a heavy nonstick skillet over medium-high heat. Brush both sides of halibut with oil. Place halibut in heated skillet and cook, uncovered, about 3 to 4 minutes, until browned. Shake pan occasionally to keep fish from sticking. Turn fillets over and season with salt and pepper. Cover pan tightly and reduce heat to medium. 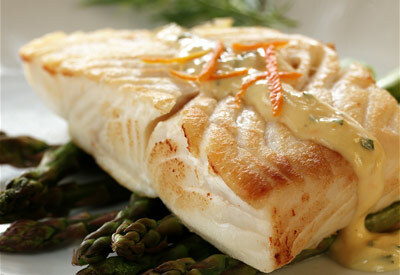 Cook an additional 6 to 8 minutes for frozen halibut OR 3 to 4 minutes for fresh/thawed fish. Cook just until fish is opaque throughout. While fillets are cooking, cook asparagus spears in small amount of water over medium-high heat until crisp-tender. Drain and keep warm. Place 1/4 of the asparagus on plate. Top with a halibut portion and drizzle with sauce. Repeat for all portions.